Could the strange actually be true? This book takes readers on a tour of the eerie and unexplained—from the search for vanished civilizations to the science of real-life zombies, from famous UFO sightings to encounters with ghosts and otherworldly creatures, and much more. Chapters include: Psychics and Mediums; Telekinesis and ESP; Future Foretold; Curses; Mystic Geography; Mysterious Vanishings; Secretive Societies; Vampires and Zombies; Ghosts and Hauntings; More or Less than Human; Near Death Experiences; Cryptozoology and Botany; Unnatural Science; Aliens and UFOs; more. A heavily illustrated, deluxe all color book. Published at $17.95, our price $12.95. 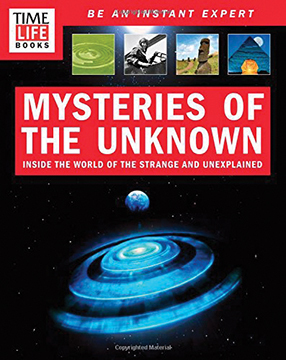 TIME-LIFE MYSTERIES OF THE UNKNOWN: Inside the World of the Strange and Unexplained By Time Life Books. 272 Pages. 8x10 Paperback. All Color.